I have sung popular Middle Eastern songs in Arabic in Jordan, Morocco, the West Bank, Iraq and Egypt. I have sung popular Turkish songs in Turkish in Turkey. I have sung popular Greek songs in Greek in Greece. I have sung popular Inca songs in Quechua in Peru. Kristina and I will be singing on October 17th, 2003, in Cairo for 60,000 people at a fundraising event for a new children's cancer hospital being constructed there. We will represent the generous spirit of the American people to the best of our abilities. 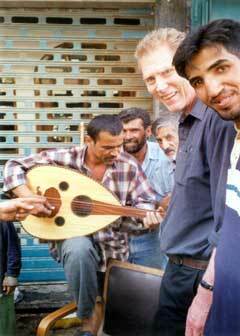 I have been generously embraced in friendship by countless Middle Easterners who have encouraged me over the last 30 years of musical training in Arabic music. The first Middle Eastern friend who ever helped me with the Arabic lyrics of a song back in the mid 1970’s was an Iraqi. I am an American. I believe in the goodness of the American people. I sing here in America bringing popular music in Arabic, Greek, Turkish, Armenian, Bulgarian, Spanish, Tajik and Persian to Americans. When I am invited to sing in the Middle East, I feel deeply honored. I am a peoples’ musical diplomat. Other diplomats may be giving speeches to government gatherings, but I am singing songs at theater and streetside happenings. I have become hopelessly global. Kristina and I just returned from two trips to the Middle East. I felt a calling to return the deep love and support given to me by my Middle Eastern friends. Not all of us have the musical and linguistic tools to go and make contact with ordinary Middle Eastern people. I do. If you can offer support, please please make a contribution at the website below. I feel that I am representing many of you when I make these trips. Please go to www.cameronpowers.com and become a Subscriber or make a Donation. I represent only myself and you: I belong to no institution, no government agency, no organizations. This is strictly a people to people adventure. Far away a barren land under the burning sun! The ground is dry, harsh, cracked. A hand, as dry as the land, unburies itself from the ground up to its wrist and palm facing up starts dancing a dance so intense and so alive that its waves bring up another hand. They dance together. Their fingers move slowly. Their moves create music. They touch each other with words spoken by their postures. Two more hands appear from the ground and start clapping a rhythm so involving that other hands keep appearing, unburying themselves up to their wrists. Before you know the land is covered by hundreds of hands dancing, clapping, singing, and touching each other with such will! From distant rivers and hidden wetlands waters rise up to the sky and clouds gather to an evolving rhythm. A warm and filling rain starts falling down on the hands. Rain washes the soil and brings up the people and people rise up from the ground, amazed to see each other, for the first time, washed, and truly naked.